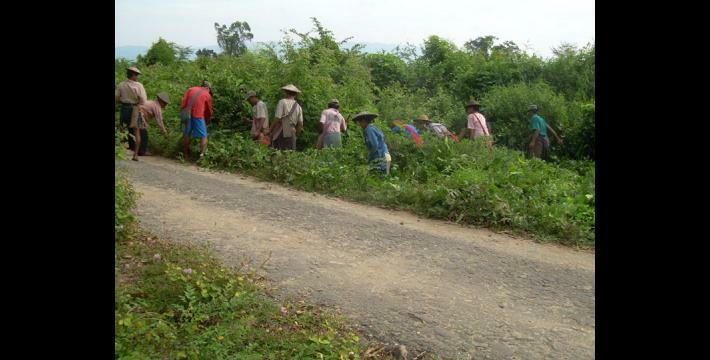 With international interest on Burma firmly focused on events in Rangoon and the regime's purported 'cooperation' with the United Nations, local SPDC authorities have continued demands for forced labour in the rural areas of Karen State unabated. Following the seasonal forced labour cycle the SPDC has once again initiated widespread forced labour projects with the onset of dry season. 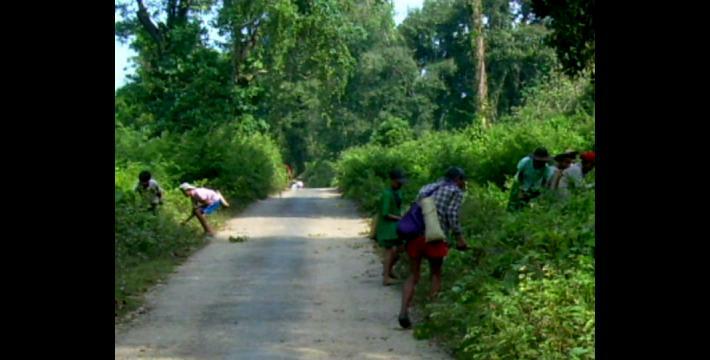 In Papun District such forced labour has included cutting down and delivering bamboo poles, constructing bridge-side fences and cutting back forest growth from the sides of vehicle roads. 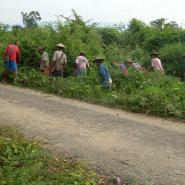 To carry out this labour local SPDC authorities have utilised women, children and men. This report includes video and photographic evidence of the SPDC's perpetration of forced labour. The severity of weather conditions in the rural areas of Karen State during the rainy season means that many forms of work must grind to a halt. Certain forms of forced labour are likewise restricted by seasonal weather conditions. As a result, the annual onset of the dry season around November marks a return to various forced labour projects that were abandoned when the rains began many months prior. When roads dry out sufficiently, local SPDC army officers press villagers into forced labour to recommence work supporting the regional programme of militarisation. Thatch and bamboo is ordered, washed out roads and military camps repaired, rainy season forest growth is cut back and new stores of rations are sent out. 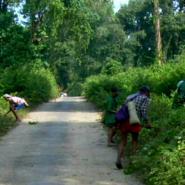 For all such work the Army relies on the forced labour of local villagers. Porters, sentries and general construction workers are requisitioned and sent to work. In Papun District SPDC units have already ordered, amongst other things, the felling and delivery of bamboo poles, construction of bridge-side fences and clearance of rainy season forest growth from the sides of SPDC-controlled vehicle roads. "Now the SPDC's time for doing loh ah pay such as sentry duty has approached us again. They are nearing the time to send their rations. They usually send their rations in December. When they send their rations we serve as security for them such as by helping them check the road. Both night and day the villagers must serve as sentries." On October 28th 2007 SPDC Infantry Battalion (IB) #216 Commander Kyaw Kyaw Aung of Military Operations Command (MOC) #11 ordered each of the 400 households in Meh village to cut two bamboo poles. Villagers were then required to deliver the 800 bamboo poles to Kyaw Kyaw Aung for the repair of his army camp. On November 9th 2007 SPDC Battalion Commander Aung Htun Lin of LIB #434 ordered that one villager from every household in Htee Ber Ka Hta and Gklaw Loh Gkloh Hta villages cut down bamboo poles and deliver them to drop off points at all bridges between Way Hsah and Papun town. At each of these locations villagers had to weave split bamboo to construct walls along the sides of the bridges. 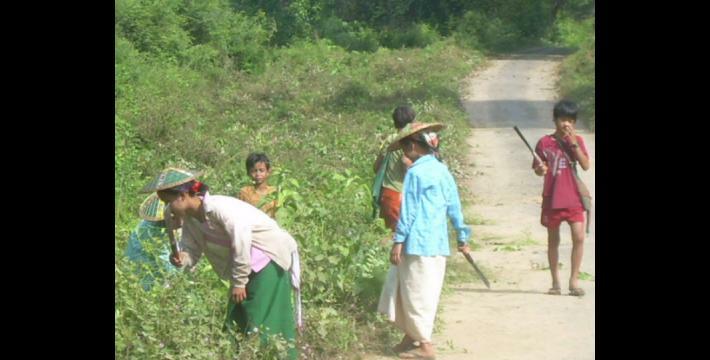 On November 11th Aung Htun Lin ordered one villager from each household at Htee Ber Ka Hta and Gklaw Loh Gkloh Hta villages to go and cut back the forest growth from the side of the vehicle road all the way from Way Hsah village to Gkoo Hsay village. Along with the Htee Ber Ka Hta and Gklaw Loh Gkloh Hta villagers Aung Htun Lin also ordered villagers from Way Moh, Way Hsah, T'Gkoh Teh, Kler Koh, Gkyaw Klee Loh, Bpoh Baw Koh, T'Dwee Koh, Nah Gkoo Nah, Gkoo Hsay and Noh Law Hsoo villages to likewise do forced labour cutting back growth from alongside the vehicle road. As of November 12th residents of Way Moh, Way Hsah, T'Gkoh Teh, Gklaw Loh Gkloh Hta, Noh Law Hsoo and Htee Ber Ka Hta villages had already complied with the forced labour demand, although those from the remaining villages had yet to carry out the order. The SPDC authorities ordered the residents of each of these villages to cut back the forest growth to a depth of 5 arm spans (9.1 m. / 52.5 ft.) along a three furlong (603 m. / 660 yards) length of the road, although in some areas the required length was two furlongs (402 m. / 440 yards). "We had to clear the vehicle road, the order was from [Light Infantry] Battalion #434. We had to clear the road between K--- and W---. We had to clear the road which was 50 feet wide [15.2 m.] and 2 furlongs long [402 m. / 440 yards]. Old and young people were also included. We were not guarded by them [SPDC soldiers] while we were clearing [the side of] the road. We had to bring along our own food. We did it [the forced labour] in one day. Mostly the villages such as Kler Koh, Gkaw Kee Law, Waw Koh, Dwee Koh, Khoo Tho Hta, Khaw Hta, Noh Waw Gkoo, Hta Poh, Gklaw Day and others which were situated along the road had to clear it." "They [SPDC soldiers] told us that they would repair the huts and fences of their military compound. Also the other villages which were near to their camp such as Gklaw Hta, Ku Baw Koh and Ka Dwee Koh had to do the same thing like us. We had to work for them without any payment. We have to cut bamboo poles and send thatch shingles three or four times in a year and we also have to clear [the side of] the road. Usually we have to clear it twice a year. Now we've had to start clearing the road on November 12th 2007. We've had to take a responsibility to start clearing the road between P--- and N--- villages." "Myanmar rejects U.N. human rights report," Reuters, December 11th 2007.